Healthcare organizations collect and process incredible amounts of information – from clinicians’ notes to lab test results to claims data and more – and volumes and types of data are evolving in every way imaginable and at an incredible speed. Innovative organizations are searching for ways to leverage all this Big Data to provide better patient care, contain costs, and sustain competitive advantage. 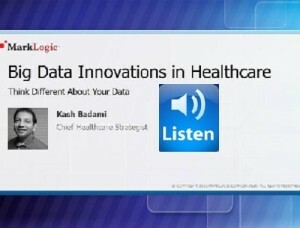 Kash Badami is the Chief Healthcare Strategist for MarkLogic and will share approaches to tackling the complexity of analytics and data management. Please join us as we put Kash in the innovation hotseat! This entry was posted in General, Innovation Talk and tagged Kash Badami, MarkLogic by admin. Bookmark the permalink.